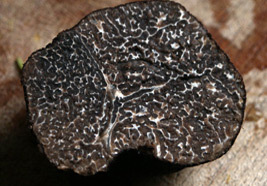 Truffles are among the most highly regarded products in cuisine, especially French-Italian cookery. They are strongly flavoured, and a small amount goes a long way in adding an exotic taste to your culinary efforts. Although they are preserved for use all year, it is during the winter harvesting months around January that the truffles can be bought and used fresh and is the best time to appreciate their flavours. Where are black truffles found? The fungi known as the Black Truffle (Tuber melanosporum) is found in Spain, southern France and Italy. The best known regions for finding the truffles in France are in the south-east and south-west and both of these regions hold 'truffle markets' during the season. and grow in association with the roots of the oak tree - hence slightly below the surface of the earth. The fungi is harvested in late autumn and winter, often using dogs or pigs that are specially trained to detect the smell of the truffles in the woods. Specialist 'truffle harvesters' (usually locals who are very familiar with the terrain and have experience of locating them) can also identify the spore pattern - a darkened area on the ground which looks burned - in the vicinity of truffles when the ground has not been disturbed. In total approximately 30 tonnes of black truffles are harvested each year, a dramatic decline from the 1000 tonnes found 100 years ago. Although associated with oak trees, truffles also need sunshine, otherwise they become rotten with the dampness in the ground. So very open woodland is the most likely conditions. 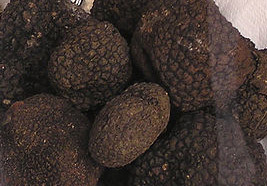 The black truffle is dark-brown-black and has a rough uneven surface. The larger truffles can weigh up to 100 grammes and reach seven centimetres in diameter. The amount you can expect to pay for black truffles varies considerably with the size of the crop for the year. £300 per kilogramme in the local French truffle markets, £800 in the shops of Paris, and £1200 in the shops of New York is a very broad guideline. The truffle you buy should be in good condition - inspect carefully for rotten parts. A small scrape will sometimes be made on the surface so that the interior can be seen - ideally it will be dark with clearly visible white veins. Final check - smell the truffle. They have a very distinctive odour and old or slightly rotten examples will not smell the same! There are several important truffle markets held during the winter months in the south of France - some are for professionals only, but many provide an opportunity to buy freshest produce first hand. 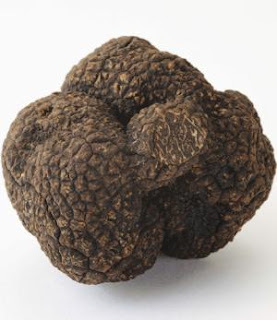 Note that truffle sellers will sometimes first sell their finest produce 'behind closed doors' to professional purchasers, so what you see in the public markets might not include the very finest specimens. In Provence these include markets at Richerenches, Apt, Aups, Valréas, Montségur, Carpentras and others. In the Drome visit Saint Paul Trois Chateaux (Tricastin) market. Near Cahors (Lot department) is the famous Lalbenque truffle market (Tuesdays, December to mid-March), and in the Dordogne are Sorges, Sarlat, Brantome, Sainte-Alvere and Thiviers. Uzés in Languedoc also holds an important market. One common and simple use for the truffles is in scrambled egg, where a small amount is added to enrich the flavour. See also truffle omelette for one of the simplest ways to cook and enjoy black truffles yourself.